This story is a bit different from the stories of the other judges. It starts the same as the people of God do what is evil and then continues by telling the story of the birth of the man who would be Israel’s deliverer. However, there is no mention of any cry to God. Sin can be like that. Sin crushes and beats down until people have no will to change their circumstances, however miserable. Great grace is shown as God begins his work of deliverance even though his people do not cry out to him. The Angel appears to the wife of a man named Manoah. This woman was barren which was a dreadful condition in those days. She is kept nameless in the text, but she is portrayed as a woman of great faith. The Angel began by revealing his knowledge the woman's circumstances, but she is told that she would conceive and give birth to a son. In preparation for the birth, she was to be careful not to drink any strong drink or eat any unclean thing for her son was to be a Nazirite to God from the womb. God was planning to use this consecrated son to deliver Israel from the hands of the Philistines. The woman shared the incident with her husband. Manoah prayed that the man of God might come again to teach Manoah them what needed to be done with regard to the boy. God heard their prayer and the Angel appeared again to the woman who went quickly to inform her husband. Manoah reviewed the details concerning the prophecy concerning their son and he still thought at this point that he was dealing with a prophet of God. Wanting to be hospitable, he offered to prepare a meal for his guest but the Angel said that he would not eat a meal. Manoah began to realize that his guest was much more than a prophet. Manoah inquired as to the name of the Angel, but the Angel refused to answer except to say that his name was wonderful. Manoah prepared the offering and laid it on the rock that served as an altar. When the flame and the Angel went up, the two fell on their faces in reverence. Manoah panicked believing that he and his wife would die because they had seen God. His wife reasoned that if God had intended to kill them he would not have accepted the sacrifice. As promised, the woman gave birth to a son and named him Samson. The Lord blessed him, and the Spirit began to stir in him. How does God's visit demonstrate his patience and care? 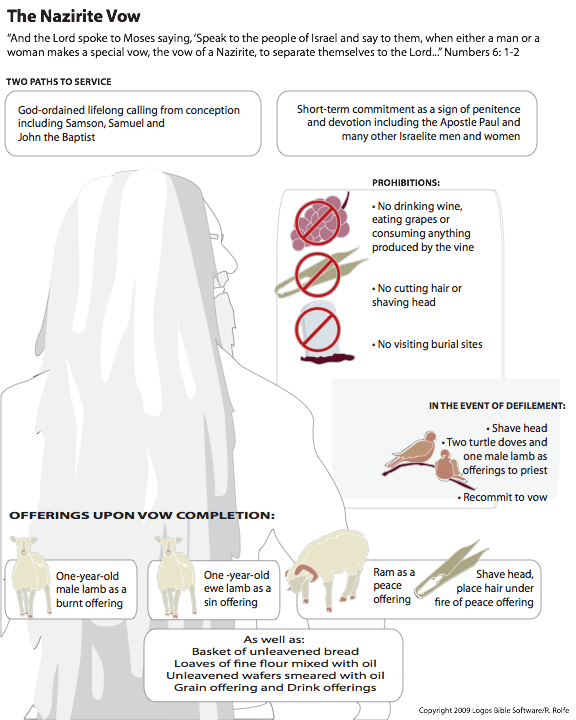 Why do you think God placed the Nazarite on Samson? What do the instructions to his mother tell us about the relationship between God and the unborn? Why will the Angel not tell Manoah his name? What does the fear of Manoah teach us about approaching God?